While on a recent trip to Austin, I had the pleasure of eating some of the best vegan meals I have ever had. In fact, I am still riding on a food high from the meal I ate at Mother’s Café and Garden. While I was happy to see there was a bit of a line for a table, even during the kind of odd eating time of 2:30pm, I was even happier that we were seated within 10 minutes and given a basket of complimentary chips and salsa. With my belly temporarily sated by the chips and salsa, I sat down to tackle the giant and daunting menu. While I vacillated between everything from the BBQ tofu with sage mashed potatoes and black-eyed peas to spinach lasagna and their riff on a sloppy joe, I kept coming back to one item and as strange as it might sound to order in a restaurant, I knew that the BUENO BURGER was mine. 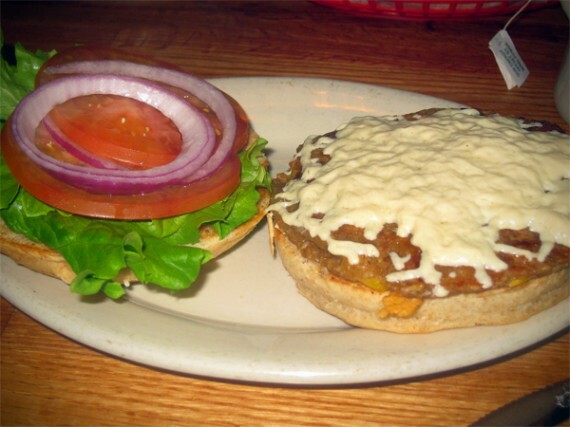 I was in the mood for a sandwich, saw that the bueno burger had been voted the best veggie burger in Austin PLUS could be topped with Daiya. I made that order and never looked back. The burger arrived on a giant wheat sesame seed bun, lightly toasted and “buttered”. Now it needs to be said that bread is my favorite carbohydrate and I have high standards for the glue that holds the sandwich together. This bun was an absolutely fantastic receptacle for the burger. Oh the burger. Topped with Daiya cheese, lettuce tomato and onion, along with a tofu Dijon sauce I ordered, this burger was so good, I managed to forget that the waitress forget to bring me the ketchup I requested (my only qualm is that the service was a bit spotty). 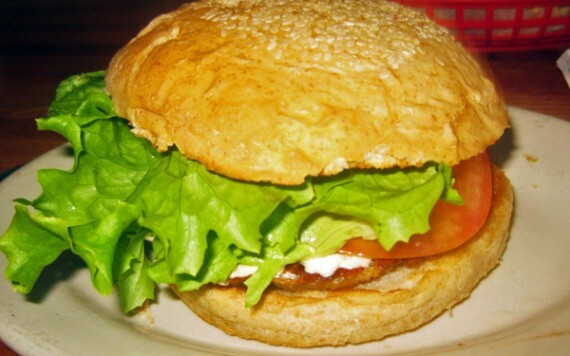 It was crispy, flavorful and dare I say the best veggie burger I have ever eaten? My companions could not stop raving about their food either: one of them got the spicy tempeh enchiladas topped with Daiya and served with rice and beans and the other got a Chili Melt, basically a deconstructed burrito bowl. Despite being full to the brim, I reminded myself that there is another stomach for dessert. 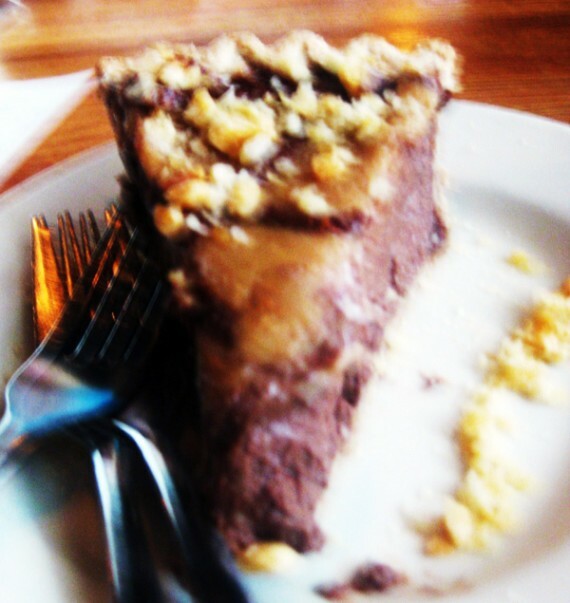 While there was a very extensive and mostly vegan friendly menu for dessert, I knew at first glance that I must have the chocolate peanut butter pie. This picture does not do it justice but let’s just say I allowed my friend 2 bites and single handedly devoured the rest. The filling was luscious, creamy and the perfect ratio of chocolate to peanut butter (am I the only one who finds some chocolate PB desserts to be too much of one, not enough of another? ), the crust was firm and tasty and the crushed peanuts on top enhanced the flavor and brought a new texture to the table. Anybody who lives within a 100, I mean 300 mile radius of Austin should make the trip to Mother’s…I wish I could go back tomorrow! 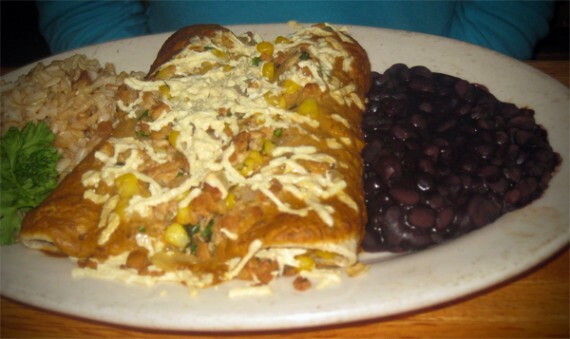 The Spicy Tempeh Enchiladas look fantastic! yay! i just found out i’m going to sxsw this year and was looking for places to eat in austin!!! This looks great! I’m going to Austin in a month and Mother’s is on my itinerary (yes, I plan out my restaurants, too!). Thanks for the review.